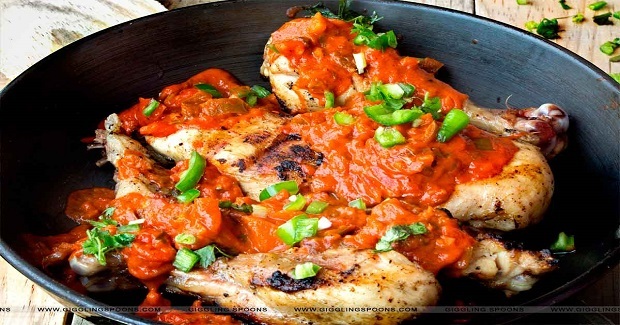 Brazilian Grilled Chicken With Tomato-Coconut Sauce Recipe - Gutom Na! Posted on Friday, July 8th, 2016 at 7:49 am. In a shallow dish combine 2 Tbsp Oil and two-third of the minced garlic. Marinate the chicken with 2/3 of the garlic oil prepared in step 1, salt, pepper and reserve the 1/3 of the oil for basting. Meanwhile take the leftover 1 Tbsp of Refined Oil in a wok and heat over moderately low heat. Add the onion and cook stirring occasionally till translucent. Add the remaining garlic, ginger and the minced jalapenos and cook stirring for around 2 mins. Now add the crushed tomatoes, tomato puree, coconut milk, salt and 1/2 Tsp ground pepper. Bring to a simmer and cook until thickened.Add the cilantro and stir.Turn off the gas, the sauce is ready. Now light up a grill/tandoor and grill the marinated chicken for around 10-15 mins basting with the remaining 1/3 garlic oil turning in between (so that both the sides get grilled). Pour the prepared sauce over the grilled chicken and serve hot.